Japanese fishermen are killing thousands dolphins and porpoises every year. Help Us Stop Them NOW!!! In October 2007, Whaleman Foundation founder Jeff Pantukhoff took two of our spokespersons, Hayden Panettiere and Isabel Lucas, to Taiji Japan to take part in a peaceful protest being led by Jeff’s colleague, Australian surfer Dave Rastovich. This protest was to help raise awareness to and stop the Taiji dolphin slaughters that take place every fall and winter at Taiji’s notorious dolphin killing cove. Hayden, Isabel, and Dave along with 3 others paddled out into the blood filled waters and formed a memorial circle honoring all the dolphins that had already been killed there that morning. Soon the Japanese fisherman confronted them and began jabbing them with large poles and threatening them with spinning propellers. Jeff was there filming along with the camera team from the Oceanic Preservation Society (OPS). The footage went viral and caused an international media frenzy and the action was featured in the Academy award winning documentary film ‘The Cove”. Even with all that attention, the killing in Taiji continues with over 1,000 dolphins still being killed there every year. This brutal massacre, the largest dolphin kill in the world, goes on for six months of every year, from September through April. Even more shocking, the captive dolphin industry and marine parks around the world are a willing accomplice to the kill, paying as much as $100,000 per captured dolphin. 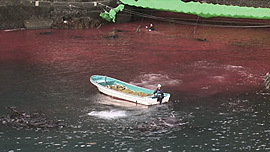 The Taiji dolphin slaughter starts in September and continues for six months. The types of dolphins captured and killed include bottlenose dolphins, striped dolphins, pilot whales, false killer whales, spotted dolphins, and Risso’s dolphins. As bad as the Taiji dolphin slaughter is, elsewhere in Japan, over 17,000 Dall’s porpoise are slaughtered every year for their meat. This is the largest kill of any dolphin, whale or porpoise species and to date over 400,000 Dall’s porpoise have been slaughtered since these hunts began. 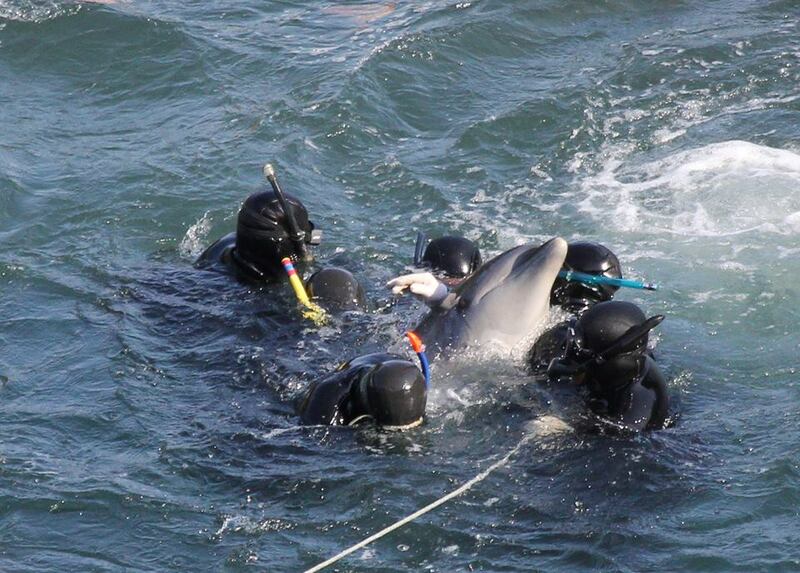 Last year over 100 dolphins were captured and sold! The Japanese fishermen’s principal justifications for capturing and killing dolphins and porpoise is that it’s a tradition that they are proud of, yet they have gone to and continue to go to great lengths to cover up this insidious act. The fishermen physically confront Protestors and journalists and threaten them. What the actions of these fisherman are really saying is we have something to hide behind these green tarps and we are ashamed by our actions. Much of the dolphin and porpoise meat from the slaughter is sold and finds it way to Japanese markets labeled as whale meat. This meat contains extremely high levels of contaminates including mercury, PCBs, and Dioxin and Japanese health and government officials have declared it “unsafe” for human consumption while several major Japanese grocery store chains have pulled it from their shelves, yet the killing goes on. Why, because mainly the captive dolphin industry is fronting the Taiji hunt while hiding behind the scenes. It’s Time to Stop this Senseless Slaughter Now! 1. Write the Japanese Prime Minister, Shinzō Abe, and tell him you will not purchase any Japanese products or visit Japan until they stop killing and capturing dolphins and whales or “Click Here to compose and send your message“ directly to the Japanese Prime Minister Shinzō Abe.